Tami Longaberger is CEO of The Longaberger Company, the premier U.S. manufacturer of handcrafted baskets and other home and lifestyle products. With great tenderness, transparency, and candor, this book opens her heart, offering readers a glimpse of her unique American Dream the kind not handed down or given freely but earned by hard work and fierce tenacity. Whether sharing memories of her impoverished childhood in Appalachia or accounts of reaching out to business women of the Middle East, Longaberger evokes a balanced nostalgia for the sweetness of the past comingled with a passionate call for hope for the future. Weaving Dreams prompts readers to dream bigger, think more broadly, and risk taking the road less traveled in business and in life. The life lessons remind us that we are all much more similar than distinct, that we have much for which to be grateful, and that the love of family is a treasure to be valued above all else. 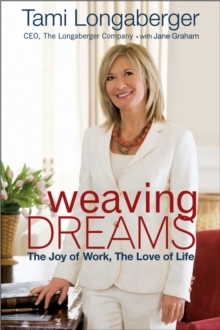 In Weaving Dreams: The Joy of Work, the Love of Life, Tami Longaberger emerges as a clear voice of encouragement and inspiration, challenging us all to live each moment to the fullest.